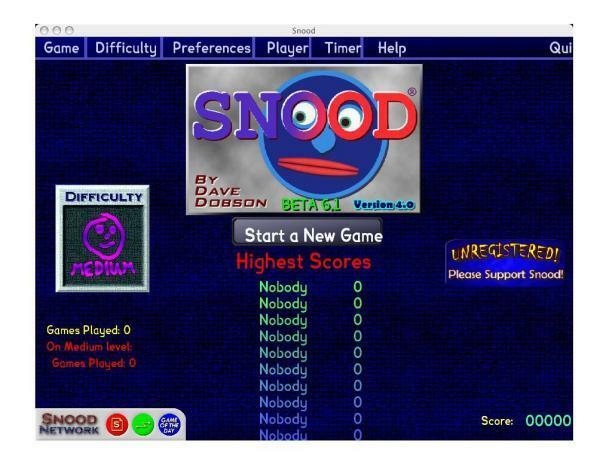 Snood for Mac is a fun puzzle game that will test your intellect rather than your reflexes for Mac OS X users. Your goal is to free trapped Snoods by launching other Snoods at them. If you connect three or more Snoods, they will transport away. If that action leaves any Snoods not connected to the top of the playing field, they will fall to safety. Don't take too long, though; every Snood you launch increases the danger level. This connect-the-critters game is reminiscent of Bust-A-Move and will captivate players of all ages. Similar to other puzzle games, the rules of Snood are simple, and the only computer skill needed is the ability to use a mouse. Connect three or more identical Snoods to make them disappear from the board. If you clear the board, you win. If the Snoods reach the bottom of the screen, you lose. Play is not time-limited. Add to that a nonviolent spirit and you will see why even little kids can play. The Snood for Mac game comes with levels from Child to Evil and includes a journey through levels, plus an intriguing puzzle mode, which varies the gameplay nicely. The ability to customize levels will retain your interest, and the registered version even offers a tournament mode, which lets you play against your friends. Any puzzle gamer would enjoy Snood. Qweas is providing links to Snood for Mac 4.01 as a courtesy, and makes no representations regarding Snood for Mac or any other applications or any information related thereto. Any questions, complaints or claims regarding this application Snood for Mac 4.01 must be directed to the appropriate software vendor. You may click the publisher link of Snood for Mac on the top of this page to get more details about the vendor.